This example of the rectangular dining table from Frank Lloyd Wright's 1955 "Taliesin Collection" is one of the finest we have seen. 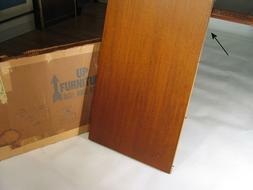 Condition on this table is especially highlighted by the virtually new condition table leaves found in the original box. 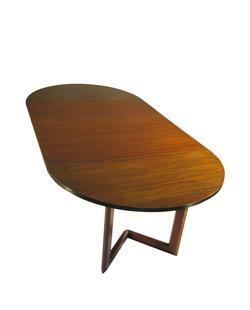 The table is, however, nearly 60 years old and has seen regular use. As a result we offer the following observations on condition. Do the leaves match the table? In terms of color these leaves match the table better than any we have ever seen. As mentioned, the table leafs here are in a near unused condition, showing the original "dry" sheen level originally used on the collection. The primary part of the table has had nearly 60 years of usage, polish, wax, and usage again; as a result the sheen level of the overall table has been raised. On one table leaf there is a small white mark at one edge. Typically we would remove this mark, but in light of the condition of these leaves, we have at least temporarily refrained from making this touch up, deferring to the discretion of the new owner. While there is general usage to our table, it is extremely careful usage. The table top looks fantastic. But when photographing directly into the light of my front door, and perched down nearly at surface level, light usage marks are visible. Emphasis need be made that these marks are only visible from an odd angle that any typical diner or other user simply wouldn't see. On one leaf, on the underside of the border edging detail, there are two chips. 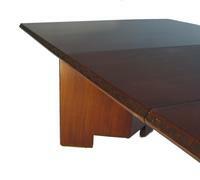 The Wright tables from the Taliesin Collection, when fully extended, tend to dip slightly in the center. 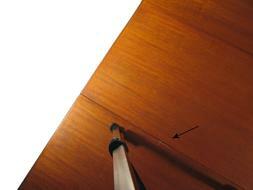 This too was evident in our prior rectangular table, as shown here.